Once again we pleased to be at The Palmerston for the lunch. Tickets are just £30 for two courses including wine. 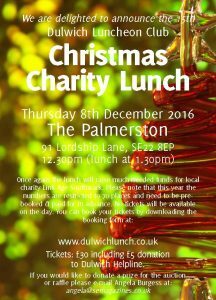 Please note £5 donation goes straight to Age Link Southwark from each ticket sold. This year the numbers are restricted to 70 places and need to be pre-booked and paid. No tickets will be available on the day. If you are interested in attending, please e-mail Angela Burgess. Please note you cannot book direct with The Palmerston. If you would like to donate a prize for the auction or raffle please e-mail Angela Burgess. Time: 12.30pm arrival. We aim to sit down to eat by 1.30pm. 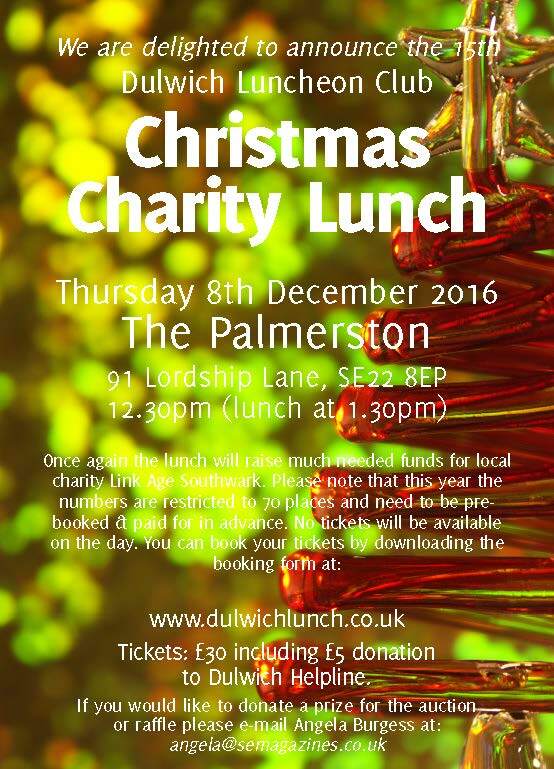 Tickets: £30 including £5 donation to Link Age Southwark. All places need to be pre-booked and paid for in advance. ← Previous Previous post: We Raised £2,200!